Fun snowflake badge. 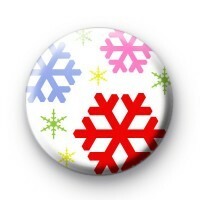 This 1-inch button badge has a colourful array of snowflakes and is super festive. Our festive badges are perfect for teachers & schools to give out during December. We have a massive range of Christmas badges with over 600 designs to choose from so be sure to take a look at our Christmas badge category. Standard 25mm badge handmade in our UK workshop.